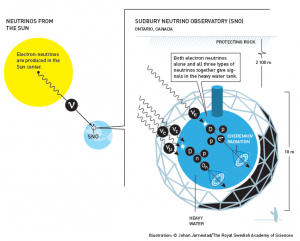 Why all the fuss about neutrinos? On October 6, 2015, the winners of the 2015 Nobel Prize in Physics were announced. Canada’s Arthur Macdonald and Japan’s Takaaki Kajita would receive the award for their contributions to understanding tiny particles called neutrinos. Neutrinos (an Italian word for “little neutral one”) are nearly massless particles that barely interact with other matter, and are emitted in massive quantities from—among other objects—the sun. Every second, a whopping 10 trillion or so neutrinos pass through your body without interacting with it! Neutrinos are still not well understood, though they may carry game-changing secrets about the fundamental nature of matter in the Universe. As the recent Nobel prize decision acknowledges, Canadian research has led the way in understanding the neutrino. As the name suggests, neutrinos aren’t electrically charged, so they don’t experience any repulsive or attractive forces from nearby electrons or protons. Instead, neutrinos are only affected by the “weak” nuclear force, one of the four fundamental forces of nature. The nuclear force acts on super small scales—at distances smaller than the size of a proton!—and is responsible for the radioactive decay of subatomic particles. The neutrino was proposed in the 1930s by Wolfgang Pauli as a way to explain where energy and momentum go after a particle undergoes radioactive decay. The neutrino was predicted to be so tiny that it was not actually detected by experiments until about 30 years later. Additional experiments showed that there were different neutrino “flavours” associated with three negatively-charged particles: electron, muon, and tau neutrinos are associated with electrons, muons, and tau particles, respectively. Even after the discovery of the different flavours of neutrinos, there was still a major unresolved issue. Physicists assumed that a large number of electron neutrinos were being emitted due to nuclear fusion within the core of the Sun. But when they actually measured the number of solar neutrinos passing through the Earth, they found only one-third of the predicted number of electron neutrinos. When these experiments were first done, neutrinos were thought to have no mass, which would mean they had no way to change flavour. But if they had a tiny amount of mass, they could change flavour as they propagated away from the Sun, possibly accounting for the missing two-thirds of the measured neutrinos. The question of whether neutrinos have mass is the same as asking whether neutrinos can oscillate, thus finding empirical proof of neutrino oscillations is also proof that neutrinos have mass. Around the turn of the millennium, two groups published results showing that neutrinos oscillate, and thus have mass. In 1998, researchers from Japan’s Kamioka Observatory found that muon neutrinos generated by cosmic ray interactions in the atmosphere arrived at the detector as tau neutrinos. Shortly afterwards, in 2001, researchers from Canada’s Sudbury Neutrino Observatory (SNO) published results of the electron solar neutrino flux. In 2002, they published results on the total solar neutrino flux, along with evidence of neutrino oscillations. All three of those original papers are free to read and download. 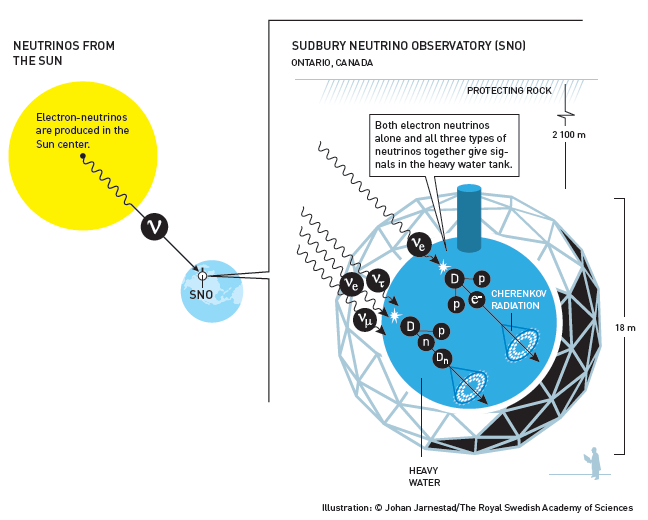 How the Sudbury SNOlab works (Image courtesy of the Royal Swedish Academy of Sciences, Nobel Prize press release). These two sets of observations proved that neutrinos oscillate and have mass, and were the reason MacDonald and Kajita were awarded the Nobel Prize in Physics last month for their groundbreaking work. Neutrinos are emitted by all kinds of Sun-like stars and from explosions of dying ones, which are commonly known as “supernovae.” Since neutrinos interact very weakly with matter, the growing field of neutrino astronomy could provide unique and important insights into the physics of stellar cores, and allow us to “look inside” stars! However, the challenge is in being able to detect neutrinos from very-distant stars. Because all three flavours of neutrinos are so hard to detect, few labs in the world are designed to examine them. Those that do exist tend to be somewhat extreme in scale: large in size to better capture the elusive particles, and buried kilometres underground to filter out as many other particles as possible. SNO is located over two kilometres underground in an active mine outside of Sudbury, the Kamioka Observatory is located one kilometre underground in a mine shaft, and the IceCube experiment is embedded two kilometres deep in the Antarctic ice sheet at the South Pole. The thickness of earth or ice shields the detectors from the vast majority of other cosmic and terrestrial particles, but neutrinos still pass through to the detectors. The infrastructure inside the Sudbury SNOlab (Photo courtesy of SNO). 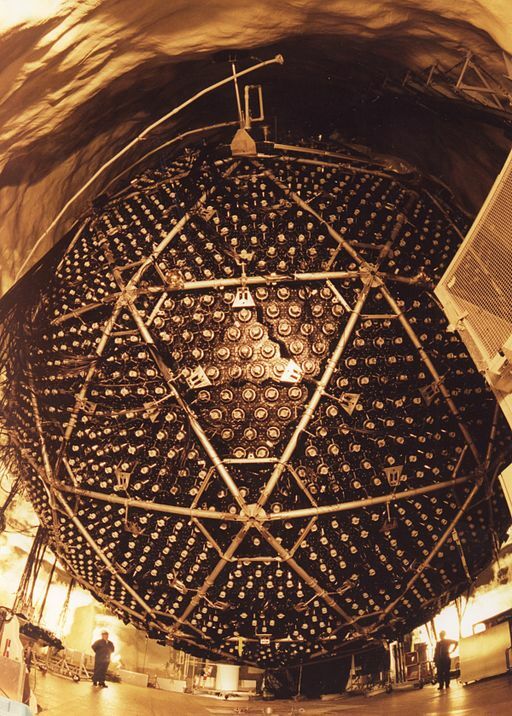 SNO was in operation from 1999-2006, and consisted of an acrylic sphere 12 metres in diameter, suspended from the roof of the mine, filled with 1,000 tonnes of heavy water and completely surrounded by photomultiplier tubes to detect any light inside the sphere. 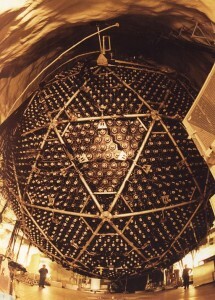 If a neutrino passing through the detector interacted with the heavy water, it produced a flash of light, which was picked up by the photomultiplier tubes and recorded. By recording the flash with different tubes, a three dimensional picture of the interaction could be constructed, which was then used to describe the original neutrino. Heavy water was used as the detector material because, due to the extra neutrons in the hydrogen atoms, neutrinos are more likely to interact in the detector. While SNO has shut down, the facility is currently being revamped for the SNO+ experiment. SNO+ will use the same acrylic sphere, but rather than using heavy water to detect neutrinos, they’ll use a liquid scintillator similar to mineral oil for better production of light from neutrino interactions. This also allows lower energy neutrinos to be detected – SNO+ will even be able to detect and describe antineutrinos. Testing at SNO+ is ongoing, though it will hopefully start collecting data in the next few years. The isolation of the mine facility is also useful for a variety of other, smaller scale experiments, and there are currently eight neutrino, dark matter, geological, and even biogenetic experiments located in the Sudbury mine. Canada remains a leader in neutrino research, with dozens of Canadian researchers collaborating on both the T2K (Tokai to Kamioka) project and Ice Cube. T2K uses detectors in the Kamioka observatory to probe an intense beam of neutrinos generated at the Tokai nuclear research facility, with the hope of further understanding how muon neutrinos oscillate. IceCube primarily searches for extremely high energy neutrinos, which come from outside the solar system and provide insight into cosmic rays, active galactic nuclei, dark matter, and supernovae. While there are relatively few dedicated neutrino laboratories, most particle physics facilities involve some research into neutrinos, since they’re an integral component of subatomic particle physics. Neutrinos are elusive but critical components to radioactive beta decay and many types of particle collisions, so research done at facilities like TRIUMF and the various nuclear research sites across the country also sheds light on neutrinos. As such, even though SNO was a relatively small collaboration (though most collaborations are tiny compared to the massive collider collaborations like CERN), there are lots of contributors to neutrino research across the country. While the Nobel prizes tend to be given to individuals, it’s important to remember that there are hundreds of researchers, technicians, engineers, grad students, and staff who are integral to collaborative research. Neutrinos are still not well understood: while we now know that they have finite mass, the specific value of the mass of each flavour of neutrino is still unknown, and there remain questions about the details of neutrino oscillations. Hopefully with the help of Canadian researchers, these ongoing experiments will bring us closer to answering some of the most fundamental questions in the universe. Environmental and Earth Sciences Arthur Macdonald, Emmanuel Fonseca, IceCube, Kamioka, neutrinos, Nobel prize, physics, SNO, Steph Taylor, supernovae, Takaaki Kajita. permalink.